CUSTOMER FIRST…it’s not just a TAGLINE. This weekend exemplifies our spirit of putting the #CUSTOMERFIRST and doing whatever it takes to get the job done. On Saturday we received a signed SoW from the client and a request to have the baseline environment ready by Sunday in order for their App Dev team to begin their work Sunday night. Within an hour we had our team assembled at HDQ in Lewisville, TX and we began building the new environment. It was through our communication, expertise and teamwork that we were truly able to deliver just what we had promised and had the infrastructure ready in time for the App Dev team Sunday night. It’s simple – when you put the customer first you find creative ways solve the business challenges. We are super #PROUD of our team and what we were able to accomplish when we are free to #INNOVATE! 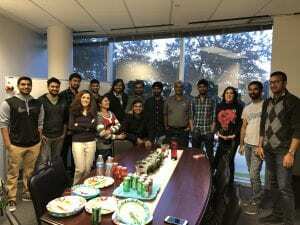 In just a short span the team at @BizCloudExperts is making a real difference in the areas of retail, fast food, banking, telecom, auto (connected car), cargo/logistics, parks/rec while working in the areas of DevOps, Cloud Management Platforms, Service Catalog, Big Data, CX and Smart Solutions. Let’s build a Serverless Application !